1. Revenue Growth – Is the Customer Value Proposition Working? The revenue growth of a company determines the overall health of the company’s customer value proposition. The goal of growth strategy is to drive better value for customers than competitors, and the output of achieving this is revenue growth that outpaces the industry. While benchmarking revenue growth seems straightforward, there is a nuance to this benchmarking that is often overlooked. Benchmarking a company’s revenue growth to the industry can be misleading, since the growth or decline of the total number of companies (firms) and establishments (e.g., stores, locations, offices) in an industry can skew overall industry revenue growth. When benchmarking revenue growth of a company, make sure you benchmark it against the revenue growth per firm and establishment of the industry. In the below example of the same industry, you can see the difference in growth between industry revenue, industry revenue per firm, and industry revenue per establishment. In this example, just benchmarking a company’s revenue growth to the industry revenue growth could be very misleading, given there is substantial consolidation in establishments and especially firms. Answering this question brings us to benchmarking the profitability of a company to the competitors in the industry. With the right data, this benchmarking is fairly straightforward. Yet, once again, there is a slight nuance that needs to be addressed, which is to ensure you benchmark profitability to those companies in an industry that are profitable. If you look at the below example of an industry, the total industry profit would be slightly negative. If you were to benchmark a company that had 5% net income to revenue to the industry, then the conclusion would be the company has a superior financial model. 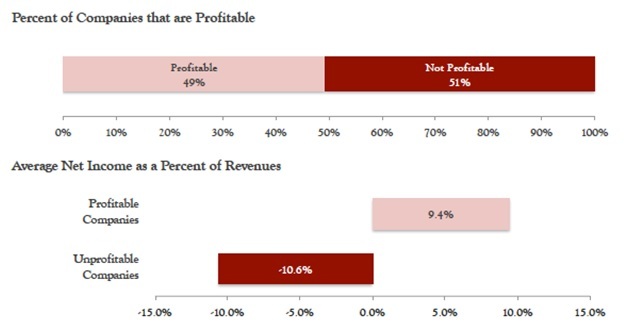 But, then if you benchmarked the same company to the 9.4% net profit margin of those companies in the industry that were profitable, the conclusion would be the company is underperforming profitable peers. When it comes to growth strategy, it is critical to understand how a company’s product line penetration and growth stacks up against the competition. Product line penetration benchmarking necessitates organizing product or service lines in segments and calculating the percent make-up of total revenues. When conducting this analysis, it always goes smoother if you first have the industry benchmarks, so you can more efficiently segment the company’s product and service lines to correspond with the benchmarks. 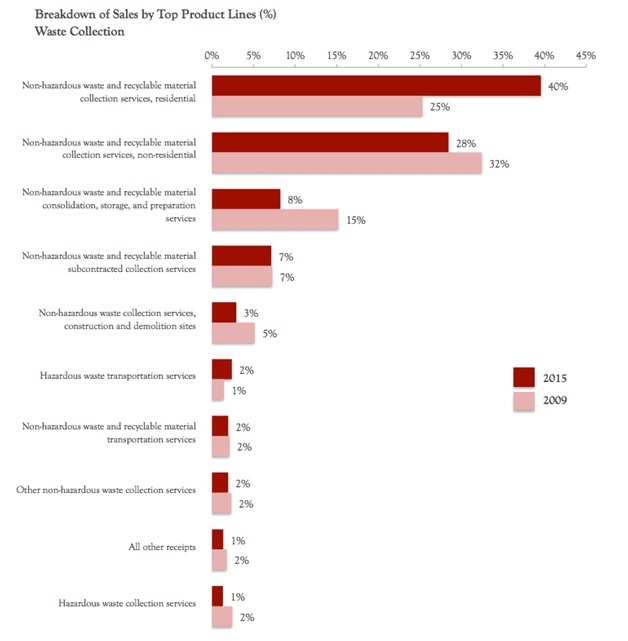 Below is an example of the product line breakdown for the Waste Collection industry. While understanding product line breakdown is a nice first step to identify potential growth opportunities, benchmarking the growth rates of the product lines is also a critical step to understand over or under performance against industry peers. 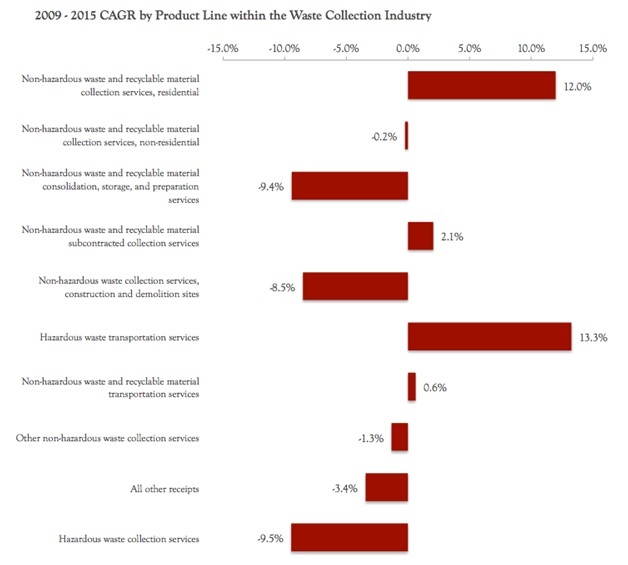 Below is an example of product line growth rates within the Waste Collection industry. 4. Productivity – Revenue per Employee – Do I Have the Right Number of People? One of the most frequent questions that comes up with management teams is, “Do I have the right number of people?” While there is often a bit of frustration when asked, it is one of the easier questions to answer through some simple productivity (i.e., revenue per employee) benchmarking. The below productivity benchmark gives a historical perspective and forecast on productivity. Simply comparing your company's revenue per employee against the industry is typically eye-opening and can help you in headcount planning or in the event of a headcount reduction. I’ve often come across companies that want to know why they are unprofitable, and once they see their productivity benchmark analysis, the answer becomes crystal clear. Let’s say productivity for a company lags that of the industry … then what? The next step is to understand if you have the right people in the right roles and positions. The first benchmarking analysis to begin with is span of control, which is the ratio of individual contributors to each manager in a company. 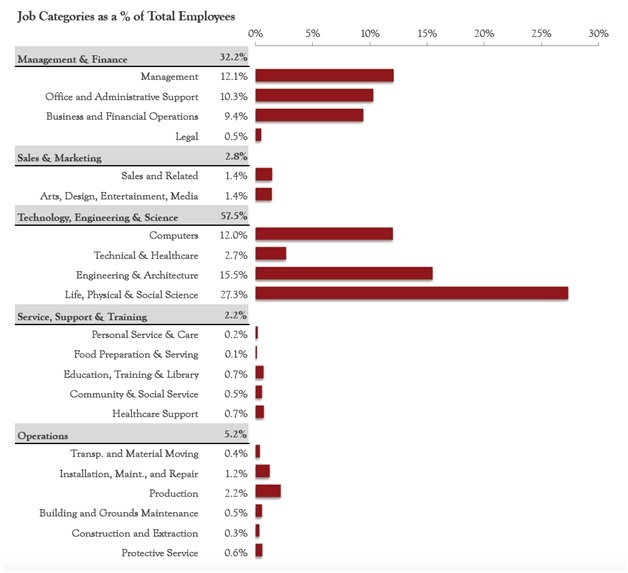 In the table below, management represents 12.1% of the industry, which equates to a span of control of ~7.3 (87.9% non-managers / 12.1% managers). Typically, a span of control of 7-10 is ideal, but it could be 15-20 for more production, retail, and some service industries. The key to the analysis is to segment the managers in an organization with only 2-5 direct reports, and then understand the drivers of the low span of control. Of course, benchmarking the functional roles of the entire company to the industry can be very informative. I typically really scrutinize administrative, financial, and legal roles, since those are often overhead and should be as lean as possible in most organizations. 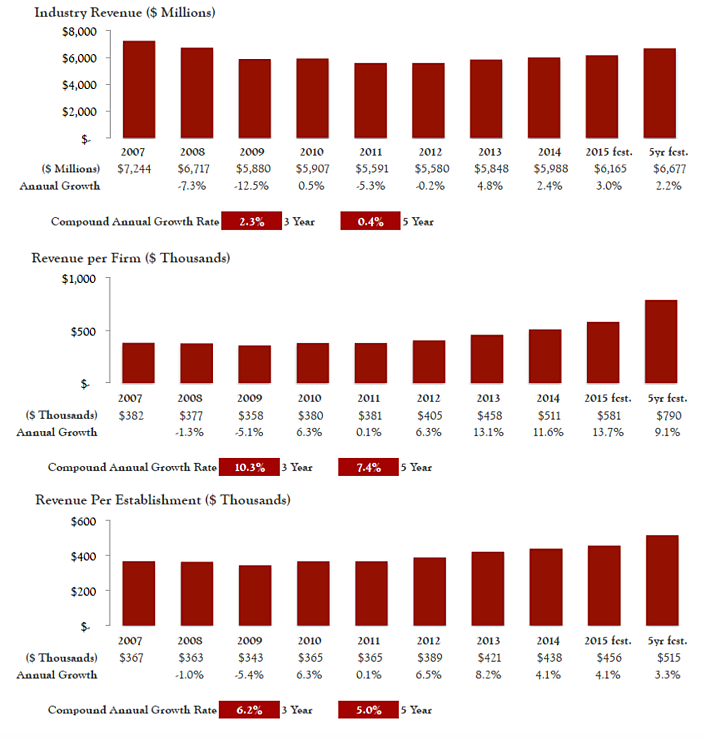 The last of the top six strategic benchmarks is operating expense breakdown. Digging into the cost structure of a company always reveals insights and opportunities. While the benchmarking analysis is typically straightforward, it usually takes the most time, given the mapping of a company’s general ledger categories to the benchmarking categories. But, once the analysis is complete, it is often eye-opening to management teams, and can lead to short-term and long-term improvement efforts to lean out some parts of operation to re-invest in those under-funded areas. 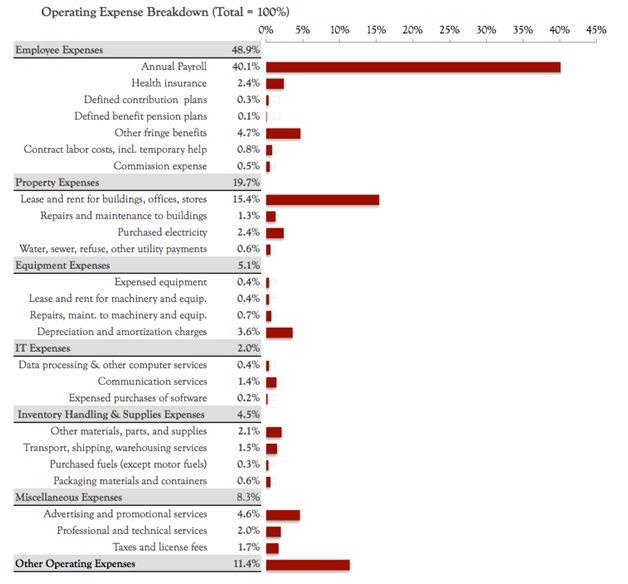 Below is an example of an industry’s operating expense breakdown. A strategic benchmarking project can create a robust fact base for identifying, exploring, and sizing strategic opportunities for any company. And, getting started doesn’t have to be a daunting task. Beginning with the top six benchmarks will ensure quick and impactful strategic insights to build upon. Kentley Insights, a partner of MarketResearch.com, publishes Insights & Benchmarking Reports on 650 industries. The top six strategic benchmarks are included in each report, along with 100+ other revenue, cost, financial, and organizational benchmarks. Find your industry now. Joe Newsum is a strategy and benchmarking expert, with over 20 years of experience supporting companies in developing and executing strategy. As CEO of Kentley Insights, Joe leads his team in providing companies with insightful industry and market data. Previously, Joe was a strategy consultant at McKinsey & Company and Mercer Management Consulting. He has an MBA from the Tuck School of Business at Dartmouth and a B.S. from Stanford University.